Amazon Price: $12.99 (as of February 12, 2019 6:14 pm – Details). Product prices and availability are accurate as of the date/time indicated and are subject to change. Any price and availability information displayed on the Amazon site at the time of purchase will apply to the purchase of this product. I Love Halloween was created by a team that seriously loves Halloween. 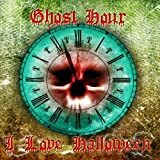 Ghost Hour: Halloween Music and Scary Sound Effects, offers you some of the best Halloween sounds and music that will make for a frightful and memorable Halloween party. The recording includes tracks such as the wild and rocking The Howling, with Werewolves on the prowl transformed by the full moon, the terrifying Zombie Hospital, with the undead wreaking havoc in the E.R., and Wicked Witches Waltzing Around The Cauldron, freaky witches dancing and laughing as they make mischief.